Brian Michael Bendis and Michael Avon Oeming's Powers is officially coming to television. Walking Dead co-executive producer Charles Eglee (also known for his work on The Shield) reportedly expected to be promoted to show runner, but when it became apparent this wasn't the case he left to work on another comic book television adaptation called Powers. FX has now taken the first official step toward putting Eglee's Powers in production. 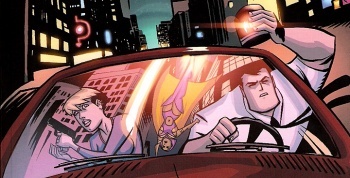 FX ordered a pilot episode of Powers, which is based on a comic book series written by Brian Michael Bendis and illustrated by Michael Avon Oeming. The reason Eglee is such a good fit is, as Bendis tweeted, Powers is "not a superhero show... It's a cop show with a superhero element. Big difference." Eglee wrote the script for the pilot. Powers follows detectives Christian Walker and Deena Pilgrim in a world where superpowers are common, but heroes aren't necessarily praised as saviors of the universe like in other books. When a murder occurs, Walker and Pilgrim show up to investigate, not the Avengers. It truly is a police drama with a superhero element, as Bendis says. A second Walking Dead connection comes from production company Circle of Confusion, which works on the zombie show, also taking a hand in Powers. Directing duties were handed to Michael Dinner, whom Deadline says is the "driving force" behind the project. This television talent combined with Bendis and Oeming, two of the comic book world's top creators, should make for another amazing show on the level of Walking Dead. At the least, I'm thinking it'll be worth making room for on the DVR.